This beautiful 45-footer is often called ‘the Beneteau 50’s little sister’ because all novelties the 50 footer showed us were refined and re-used when constructing the ‘little sister’. The most recognizable detail would be an arch above the saloon entrance, at the forward side of the cockpit. 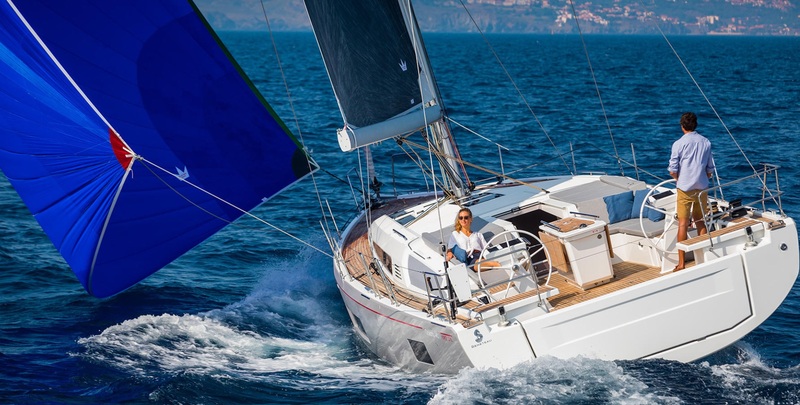 Unlike the cars, this arch’s use is not the aerodynamic wind spread but the innovative design allowing easy, quick, safe and comfortable tacking and jibing as the mainsail sheet runs from the boom to the arch. This way, the entire cockpit area is not obstructed by maneuvers providing the passengers a high level of comfort. All other working sheets are close to the skipper’s position and are moved towards the stern making this yacht governable by two or just one person if needed. The spacious and comfortable teak cockpit with a table at the center ends with a large stern folding platform. When lifted the platform can be used as a full beam transom and useful bench for the skipper. When lowered, the platform makes a great surface for handling swimming, snorkeling or scuba gear, to jump from and to get out from the sea when swimming. The interior designed by Nauta Design hides a spacious master bedroom in the front and two comfortable bedrooms in the stern, as the basic and most common arrangement. There are also options with 2 cabins for over-the-ocean sailing; or a family arrangement with 4 double bedrooms. 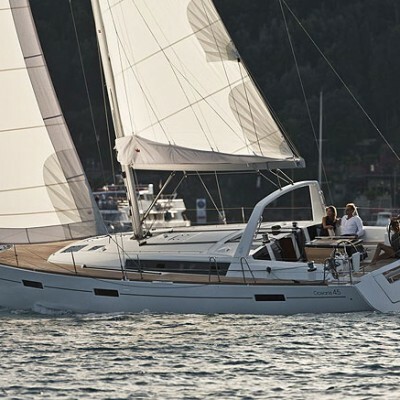 Nevertheless, this yacht was elected “European Sailboat of the Year 2012” in the family cruiser category. Pretty large and spacious saloon seems to be even bigger than it is thanks to a chart table which is also used as a living-room table so both sides of the saloon can be used for leisure when anchored or moored. Naval architects from Fino-Conq have designed a pretty simple but useful exterior. The yacht showed up as very governable under full sails thanks to the beamy hull – 4.5 m, with the extra beam at the chine aft. Such design makes this vessel easy to steer even in the conditions of moderate to strong winds and a rough sea. Standard equipment considers a horsepower Yanmar engine as its maximum with Sail Drive propulsion. 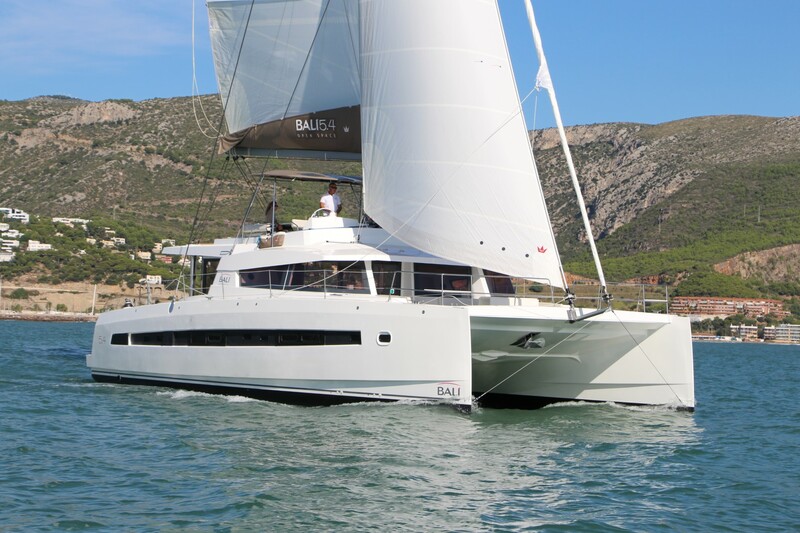 At the end of the day, the review of this sailing yacht could be concluded by an ascertainment that everything is in its place on Beneteau Oceanis 45, organized in perfect harmony, making the stay onboard very relaxed and comfortable. Furthermore, the boat’s elegant lines and modern look will for sure elicit jealous glances wherever you appear with this beautiful and harmonic yacht. Thanks to Janko. Very useful information. I’m a musician from Turkey. I live in Bodrum in summers. I own a 2016 model Oceanis 45 with a self tacking genoa and an in mast furling mainsail. I heard about a firm named Mack Sails. The thing is that Mack Sails makes a Code Zero with a UV Cover, so that one doesn’t need to put it in its bag when the sailing day’s over… What do you think about that ? Can a UV Cover really be added to a Code Zero ?